I used this phrase as a discussion prompt during a recent lunch ‘n’ learn with the iHire team. Remember being told in school that there are no stupid questions? I told the group that there are no stupid ideas. With the freedom to be honest and uninhibited, the responses I received were awesome! Transparency allows and encourages people to speak their minds, deliver feedback respectfully, and take appropriate action. Transparent people are honest, don’t sugarcoat bad news, and encourage others to do the same. 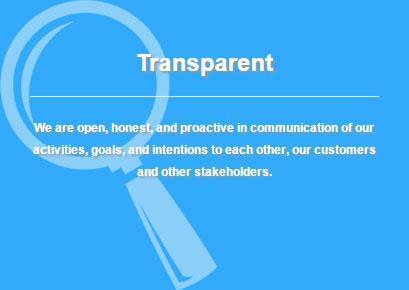 Strong relationships built on mutual trust and respect are essential to exercising transparency. I encourage everyone to be transparent, respectful, and take care to develop relationships. Stayed tuned for a post on our final core value – Collaborative.